The MOBB rollator is a great mobility aid for creating a natural balance. 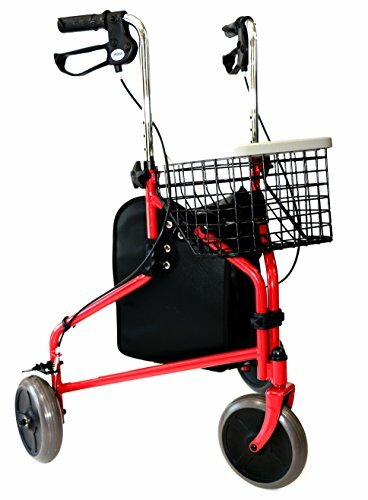 With hands grasped securely onto the handles, walk slowly behind the rollator. Gently push forward with your weight distributed evenly between the handlebars. Normal braking can be activated by pulling the brake handle up, similar to operating the brakes of a bicycle. The rollator also has a parking brake which can be activated by pushing the handle down into the lock position. To fold, lift off basket and pull up on the lock release mechanism. You can have mobility, stability, storage, and maneuverability with your 3 wheel rollator walker. Standard includes: Basket, Tray and Pouch; Basket conveniently folds for easy storage! If you have any questions about this product by Mobb, contact us by completing and submitting the form below. If you are looking for a specif part number, please include it with your message.